Richard Cohen, a veteran writer, producer and distinguished journalist, has lived with multiple sclerosis for over 25 years. Recently diagnosed again with colon cancer, Cohen describes his lifelong struggle with multiple sclerosis, his first bout with colon cancer, a loving marriage to Meredith Viera, the effect of illness on raising children, and the nature of denial and resilience, all told with grace, humour, and lyrical prose. Cohen chronicles and celebrates a life brimming over with accomplishment, adversity and personal endeavour and his story has struck a chord with readers nation–wide. He has been interviewed by Barbara Walters for a nearly hour–long segment that ran on 20/20, he also appeared on wife Viera’s program, The View and is scheduled for Charlie Rose, Larry King Live, Good Morning America, and the Paula Zahn Show, among others. Blindsided also received outstanding print attention and People magazine has run a first serial piece. 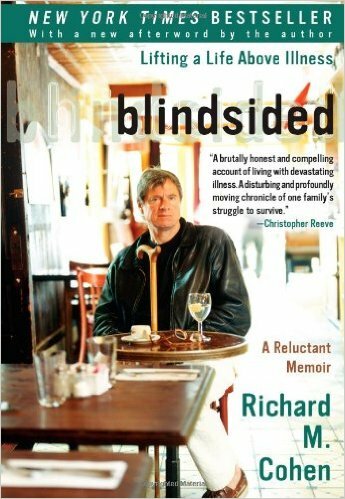 Autobiographical at its roots, reportorial and expansive, Blindsided builds on Cohen’s story as a task aimed at emotional well–being, if not survival, pursued in sober tones that explore coping to its most redemptive and complex levels. Despite his extreme circumstances, Cohen’s is a common struggle, recognisable as an integral part of humanity, and one which he explores with varying amounts of diligence, respect, personal revelation and humour.